I’m sure I downloaded this App sometime ago! But I think, at the time, I didn’t write a review or anything – because there was literally nothing there for me! I don’t know if it wasn’t working, or what. But now they say this is an all new and improved version. So, what is the “Make Money- Free Cash,” App? And can it really make you money?! How do you make make money? What do other people think of it online? 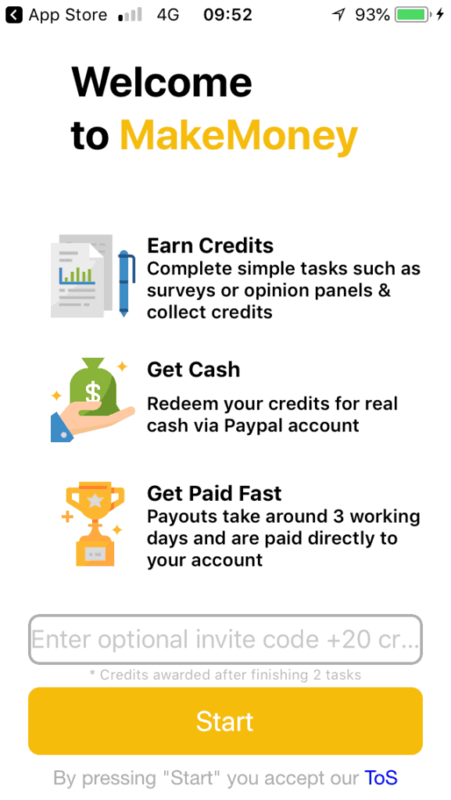 What is Make Money- Free Cash App About? With more and more people hoping to make a little bit of extra money to supplement their income, make-money apps have become one of the newest ways that people can do it. The problem is, that most apps will only make you a couple of extra dollars here and there and nothing very significant. This App is no different to this, it can give some people the chance to make a little bit of pocket money while completing tasks that they may find enjoyable. This could mean downloading games and completing online surveys. I think what you may find available here, could vary on location quite a lot. So, what you see in one country may be a lot worse or less than in other countries. I will explain that a bit more in a moment! Complete as many online tasks as you want for credits. Convert the credits into cash and withdraw via PayPal. You can download this app via the App store, or via Google Play. Once you’ve downloaded it… you can open the App and start right away. You will get 30 credits for registering – there are also 20 bonus credits for every day that you login. If you complete your profile, you can make another 50 points. 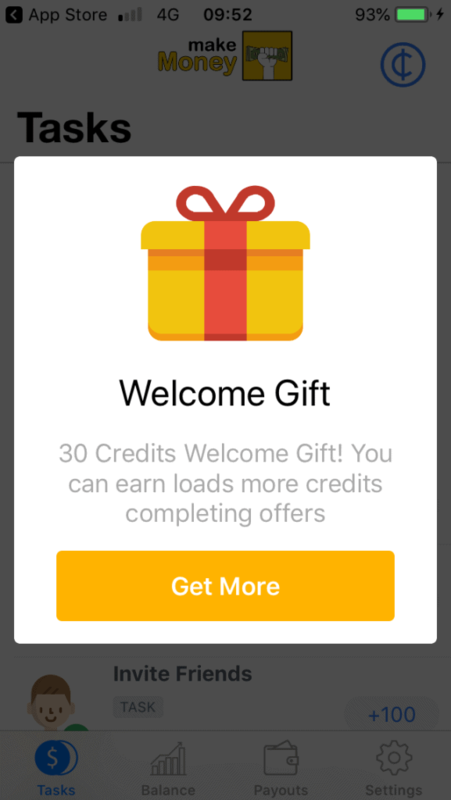 You can also get 100 bonus credits for anyone that signs up via your referral link, (which you can find on the App and share via social media, or anywhere you can paste your link). I was a bit surprised to see the inside of the App. Mainly because… Well… There wasn’t much to see at all for me. There was one main hub which, (for me) contained a small number of opportunities to download Apps for points. You don’t ONLY just download the Apps most of the time, (which some people may think you do) but you have to complete certain tasks. (The easiest) – simply installing and opening App. Reaching a certain level in a game. Download App, join free trial. Register and make a deposit, (highest paying sort). In the UK, 15,000 points = £10. You also have the option of $5 / £5 payouts. You can redeem via PayPal. Which I’m guessing would take a lot of effort! For a simpler one, I could download board kings and reach level 3 for 1374 points, (which I presume isn’t too difficult!). Or, I could simply download, install and open a paint by number App for 135 points. But even 1000 points isn’t much, when I need a minimum of 7,500, (in my case) to cash out. What happens if I completed all the offers as well, there weren’t all that many available to me? Would more appear… or would that be it? This is going to be different in the US, where I know there would be a lot more offers visible and available. This is something you will only know by opening the App and downloading it – it is free to join. There are some ways of getting additional points. Checking in every day – called “attendance rewards,” and you can earn 20 points by doing this. Watching Ads – After the check in on the second day, a video Ad played and I made an additional 2 points. Completing your profile – for 50 extra points. Inviting friends – share your referral link via social media/friends and family and earn 100 points per sign up. Share on Facebook – if you share via Facebook, you can get another 100 points. What do other people say about this app? After checking out this App for myself, I was quite surprised by the huge number of positive ratings it has. I noticed that on App store though, instead of “Free cash,” they have “Easy cash,” in their title. On App Store, (at the time of writing) it has 4.9 stars and over 111k ratings! On Google Play, the App has 4.6 stars, but well over 444k ratings, which is pretty huge. I’m suspicious of the legitimacy of some of these good ratings. Many of them seemed generic, while others just seemed a little too over-positive… considering, you really can’t make very much with this App. As I understand it though, it seems they award you with bonus points for giving a review, (or so some of the reviews say, I haven’t seen this myself yet). In which case, they have an incentive to give a good review and therefore, perhaps take those with a pinch of salt … until you try it for yourself! There are also plenty of one star reviews hidden in there, if you look for them. The one star reviews tend to say…. That they don’t get rewarded the points for the actions they take, (however, there will be specific step by step instructions to follow, which some may not take – many people make mistakes with this!). Others say that you have to do a lot of work, for next to nothing, (sounds pretty accurate). I guess it’s misleading to call it a “make money,” app really… As this is going to give some people false expectations. Many people who download it, may think that they can maybe make some reasonable cash. Whereas, in reality, it will take a fair amount of time and effort just to make $5-$10. If you enjoy doing the tasks then that’s fine, but if you think you’re going to make money fast, you will probably be disappointed. On the other hand, I have seen a lot worse than this too!! Well designed App, encountered no problems using it and easy to navigate. 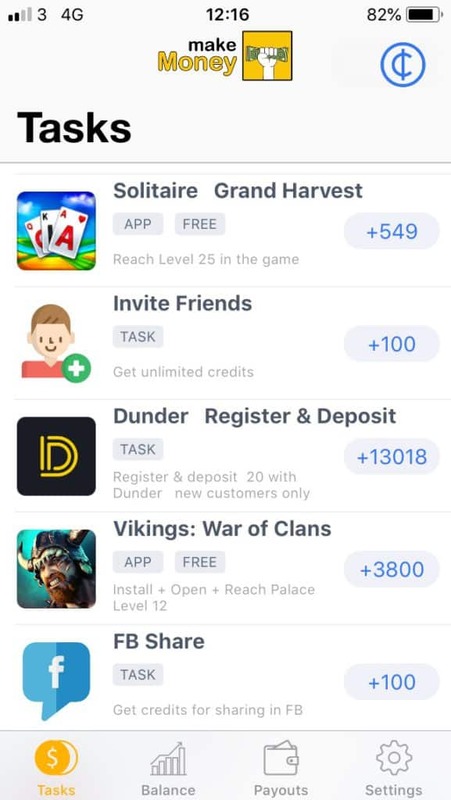 A variety of different offers, with tasks starting off from super easy, (with some requiring a simple download of an App and opening). Lots of good feedback online. You could have a lack of offers, depending on what country you sign up from. With the lower paying offers, you’d have to complete many of them, just to make the minimum cash-out amount. Some higher offers will involve cancelling trial memberships, if you don’t want to get charged. If you’re looking to make extra money, you won’t make very much! Concluding Thoughts – Is Make Money, Free Cash App Legit? This company is transparent about what this App involves and how much you will earn. You can easily see how many points you need to make money and each task is labelled with a number of points. If you manage to reach the required points, they will pay you…. So, yeh, it’s legit. As long as you don’t go into it with big expectations and know it’s mainly just for entertainment and isn’t going to make you much. I’ve checked out so many Apps, but with the exception of some website testing Apps, (where you can make $10 per test) – the income is very limited. Some of these Apps are still fun and that’s primarily what they should be used for… the extra few dollars or whatever you make, is just a bonus. So, if you’re purely doing it for the money, I would suggest you look for ways that will pay you more in the long run. If you want to learn more about making money in the long term, I recommend the training here. You may also want to check out this post – with 40+ ideas to help you make more online.